This isn't a step by step how to, more an overview. I made this pin last night. 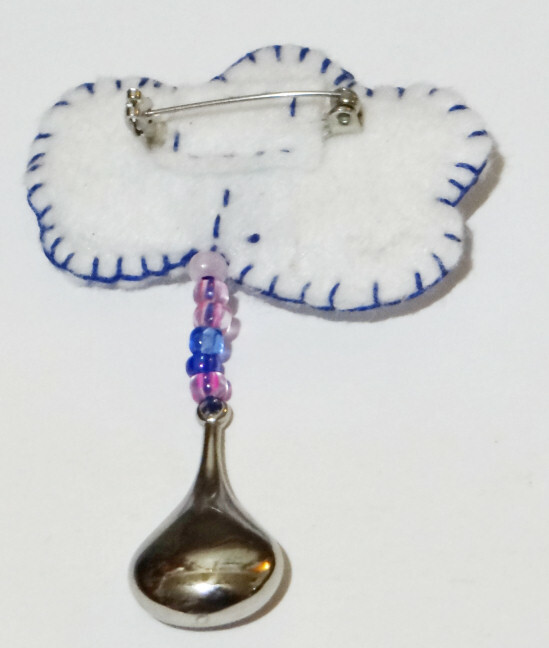 The bead/pendant hanging from the bottom is from Cousin Corporations Jewelry Basics Acrylic series. It's a bit over an inch long. 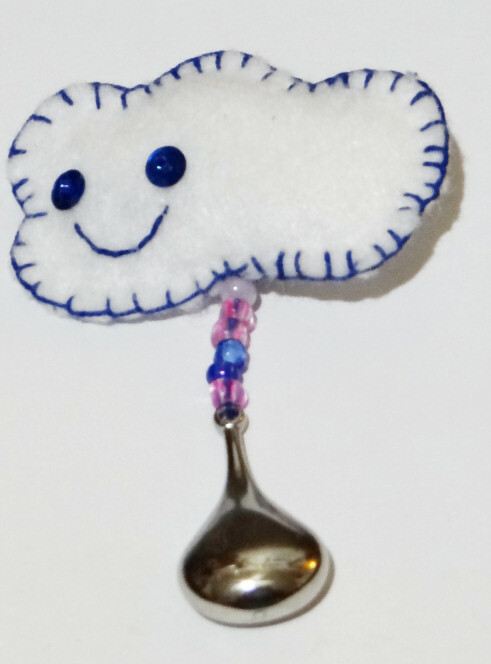 Take a piece of white craft felt about 6x2 inches, fold it in half so the 2 inch sides meet and cut out a rain cloud shape. I just freehanded a rounded shape. I'm not a fan of big bulky knots for small projects like this to keep the thread from pulling through the felt, so what I do is tie the end of my thread in a knot big enough to keep it from pulling through a light colored sequn, and use light sequins on the back where the knots will be. Embroider the face and finish off the embroidery with another sequin on the back. I also used two blue sequins that matched my thread for the eyes, held in place by seed beads. On the back, stitch the little drop with the beads and tear drop, then make a running stitch to where you want the pin back to be. Cut a small rectangle of felt that will fit over the center bar of the pin back, and stitch it in place over the pin back. Cut a small piece of plastic to sandwich between the two layers of felt. Stitch the felt pieces together with a blanket stitch around the plastic stopping about 3/4s of the way around to very lightly stuff it on the front side. Finish stitching. Super easy! And you have a cute little rain cloud pin.